This application view shows the entrance to the Fay and Gus Jones House in Fayetteville. A view of the garden room of the Jones home, showing the boulder that was incorporated into its design. A view of the daughters’ room showing the carport and walkway to the entrance. A view of the daughters’ room showing a desk and the fireplace. A view of the home’s master bedroom, located on the second floor. 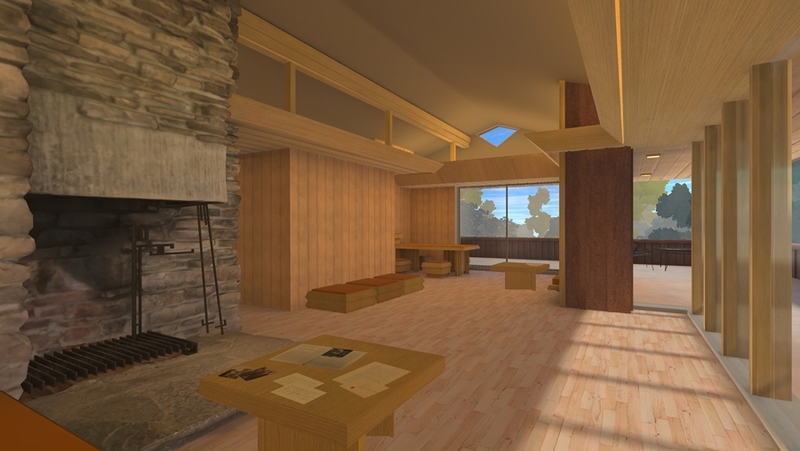 This screenshot of the application shows a view of the living room in the Fay and Gus Jones House. FAYETTEVILLE, Ark. – An interactive kiosk that explores Fay Jones’ residential design work will make its official public launch on Saturday, April 20, at the Fayetteville Town Center Plaza, during the weekend Fayetteville Farmers Market. It will be available from 9 a.m. to noon., and the public is invited to experience this innovative project in person. “A House of the Ozarks” is an interdisciplinary project led by Greg Herman and David Fredrick, both University of Arkansas professors, and intended to bring Jones’ work to a wide public audience. This kiosk is one element of the project, along with a corresponding website, which also will go live on April 20. The A House of the Ozarks website can offer visitors a fuller experience of the application because they are likely to spend more time exploring it. The website also makes the information and interaction accessible to people living around the world. The website offers a digital archive of the documents and photographs collected for the project, and it allows people to connect with the designers. The kiosk experience offers a virtual interaction with the Fayetteville home that Fay Jones designed for his family, as well as a speculative house designed for the property next door. By engaging with the kiosk software, people can visit a historic home not generally open to the public, as well as a home that was never built. Visitors can explore the exteriors and interiors of both homes, though the experience is more complex with the Jones house interior. “We allow the user to view the houses from a bird’s-eye view, giving them a different perspective – one that allows for the viewing of the entire form of the house, which would not be accessible in real life,” Fredrick said. They took their prototype kiosk to the market in October for a trial run, with the idea of seeing how people interacted with it and determining ways to improve on those experiences. Most people last fall spent more than five minutes with it, Fredrick said, which is a long time for an outdoor touch kiosk. “A lot of people were impressed at the graphic quality and really interested in being able to explore the house,” he said. The kiosk designers notice that some people struggled to perform certain mechanics, and there seemed to be a need for a built-in introduction that gave context to the application. “We have implemented a more robust ‘help’ function that places the user into an introduction and tutorial, which walk them through the things that they are about to do within the application,” Fredrick said. They also redesigned some functionality to make the interaction more intuitive from the start. Since the fall, artists and programmers in the university’s Tesseract Center for Immersive Environments and Game Design added in more pieces of the furniture Jones designed for his family’s home and improved the visual quality of the structure and landscape. While moving through the Jones house and experiencing it at a human scale, users can discover documents, photographs and curated information about the house. More of these elements were added after the feedback from last fall’s trial run. “This turns the experience into a deeper learning opportunity and allows people to discover digital copies of items that have only been kept physically in an archive up until now,” Fredrick said. A “Time Map” mode also has been added to allow a user to explore a curated timeline while viewing a map of the United States. As they progress through time, different events and architectural works pertaining to Fay and his contemporaries will appear on the map. The user can interact with some of these events and works, seeing short descriptions and photos when available. “We hope that this feature will give users more context about the environment Fay was working in, as well as how he and his contemporaries developed these new ideas in architecture over time,” Fredrick said. Eventually, they plan for the kiosk to travel to high-traffic locations around Northwest Arkansas. The broad reach provides more chances for the public to learn about Jones and his architectural contemporaries. Jones, an Arkansas native, U of A alumnus and long-time Fayetteville resident, was a world-renowned architect and recipient of the American Institute of Architects Gold Medal. He was also a long-time architecture professor and first dean of what is now the Fay Jones School of Architecture and Design, named in his honor 10 years ago. Jones is renowned for an architectural approach that combined simple elements — stone, wood and glass — into an expression of great richness, while retaining the organic principles and simplicity of expression derived from his mentor and early employer Frank Lloyd Wright. Jones’ Thorncrown Chapel in Eureka Springs, completed in 1980, has been listed by the AIA among the most significant buildings of the 20th century. Several of his designs for houses and chapels have been honored by the architecture profession for the strength of their design and their appeal to a broad audience. Jones’ own house in Fayetteville, occupied in 1956, was the first project he completed at the start of his independent professional career. Referred to as “Fay’s Experiment” by his wife, Gus, the house includes many of the signature components and details that would be refined in the architect’s more mature work, and thus serves as a critically important sampler of his design intentions. Herman is an associate professor in the Department of Architecture in the Fay Jones School, and Fredrick is associate professor in the Department of World Languages, Literature and Culture in the J. William Fulbright College of Arts and Sciences and director of the Tesseract Center. The professors recently talked about their work in this episode of the Short Talks From the Hill podcast. This interdisciplinary project is supported by an $86,000 award from the Chancellor’s Innovation and Collaboration Fund for 2017-2018, with additional support provided by the Fay Jones School of Architecture and Design.